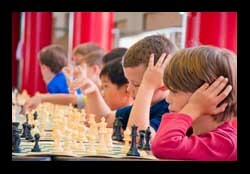 Much research and numerous studies have shown that chess can strengthen a child's mental clarity, fortitude, stability, and overall health. Some of the more valuable gifts we recieve in chess are not only intellectual, but psychological and emotional. Good chess players are on a dual track of being aware of and utilizing emotions as much as honing cognitive abilities. Some of the gifts of chess include learning to unleash curiosity, to develop grit and install optimism. Chess can teach us to see a kalaidescope of solutions to one problem. During the study and playing of chess, students become exposed to seeing novel and different ideas to a set of problems. Playing chess allows us a wonderful level of creativity, to celebrate freedom, but the same game punishes laziness and bias confirmation. Asking self-critical questions such as "if I do this now, what happens to my position down the line a few moves later"
In other words, "How are my current decisions today going to affect me tomorrow, next week, next semester, etc?". 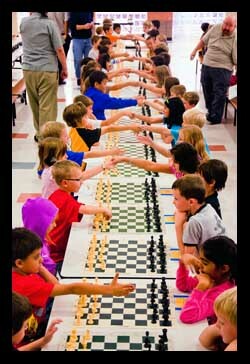 Chess can and should be part of every child's curriculum starting at age four or five. The Chess Emporium provides a variety of classes and activities designed to bring children to chess with fun, passion and drive. If you want to offer this gift to your child take a look at our Premium Center Chess4Life classes. These classes are the best starting point for students and will provide them with the tools they need to have fun and be successful in learning this complex game.